Here, we’ll describe how you can add cloth simulation to your existing Golaem simulations. To start this tutorials, the basics assets and settings for a Golaem Crowd simulation should already be done and the base concepts of the Crowd simulation should already be fully understood. To add cloth simulation to any of your asset, the first step is to import its geometry file (fbx or gtg), and then configure cloth on the imported objects using nCloth and nRigid nodes. Please refers to the Maya documentation about the cloth simulation, as Golaem Crowd only duplicates cloth nodes but don't make a simulation of its own. Only Maya nCloth, nRigid and constraints are duplicated in a Golaem Crowd simulation. In this case, the Baniere_01 is going to be configured as a nCloth, constrained on the nRigid Lance_02. Once the cloth simulation is working as expected in Maya with any crowd, it is time to duplicate it on the crowd simulation. - Open the Behavior Editor for your EntityType and add a Cloth Behavior . If it's the first cloth behavior in the scene, a Cloth Locator will be created at the same time. 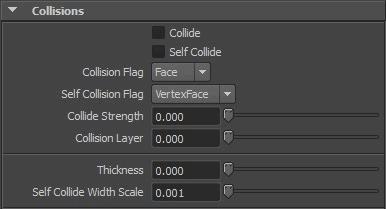 - Configure the Cloth Behavior by adding the nCloth object(s) in the "In Cloth Geometry" list, and the nRigid object(s) in the "In Skinned Colliders" list. The list should at least contain every objects that are used to constraint the objects in the "In Cloth Geometry" list, but other nRigid objects can be added also for collisions purposes. 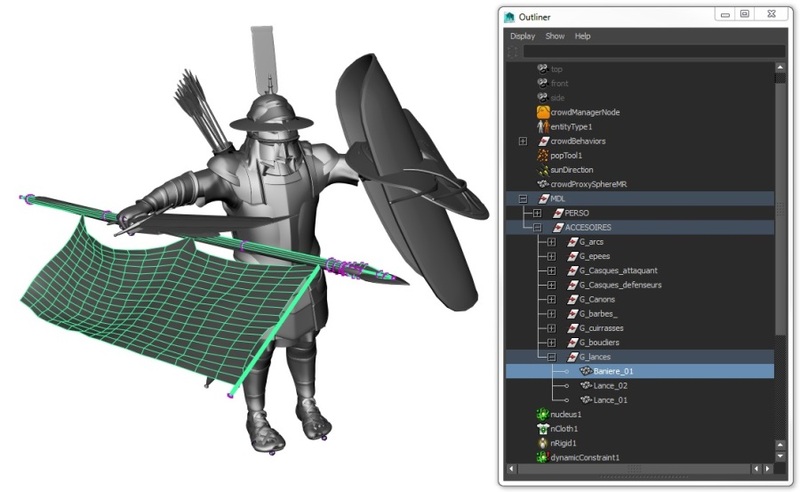 All the meshes listed in the Cloth Geometry must be attached to a nCloth node, while meshes listed in the Skinned Colliders must be attached to a nRigid node. All of them must be listed as Meshes in the Geometry Tab of the relative Character File with the exact same name (beware of namespaces). This is particularly useful to disable the cloth simulation on the source cloth objects while enabling it on the Crowd simulation. It also allows to configure the Nucleus solver with settings for better performances (but lower quality). Please refers to the Maya documentation about the nucleus node. Note that the "Start Frame" of the nucleus node must be at least 2 frames later than the CrowdManagerNode's Start Frame. This is necessary to let enough time to the Crowd Manager to prepare the simulation for nucleus. The simulation can now be run like any other Crowd Simulation, and clothes should be visible for both the previsualization and render with nothing else to configure. And here is the page provided by Autodesk for Optimizing nCloth.